Please refer to the dedicated test setup page here as it applies to this review as well and I did not want to go over it separately to save on review space. 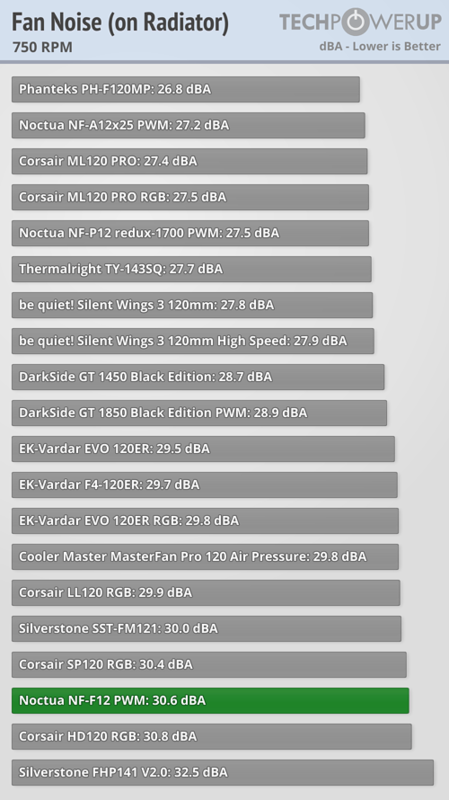 Let's remind ourselves that the fan is rated for 300 (+/- 20%) to 1500 (+/- 10%) RPM. The provided sample, and this is based on one data point at each measurement thus, went from 1479 RPM at 100% PWM duty cycle all the way down to 288 RPM at 10%, and remained there all the way down to 1% duty cycle. 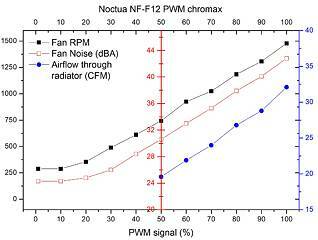 The RPM vs. PWM curve is fairly linear until ~20% duty cycle, which is good in terms of being able to predict the fan's behavior by simply setting a fan curve for linear responses over the long ~10%–100% duty cycle range. 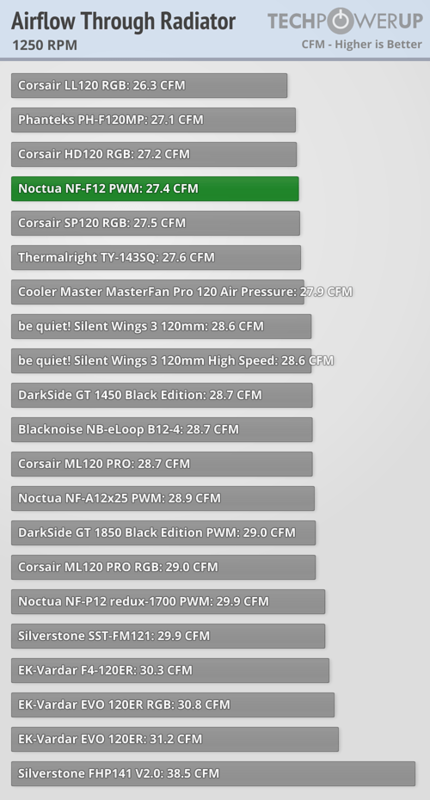 Context is needed to talk more about the fan's performance and noise, so I have below comparison charts for some fans tested so far at set RPM values (or as near as they can get to those). 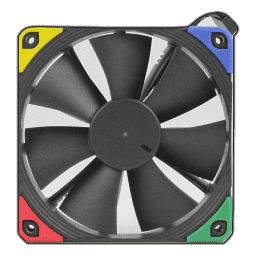 I have included fans in charts where the rated RPM is within 50 RPM of the chart cutoff point, which means that some fans are in specific charts only if their rated speed is over 50 RPM off from a threshold value (Corsair SP120 RGB, for example) or they simply do not slow down enough (NB-eLoop B12-4, for example). 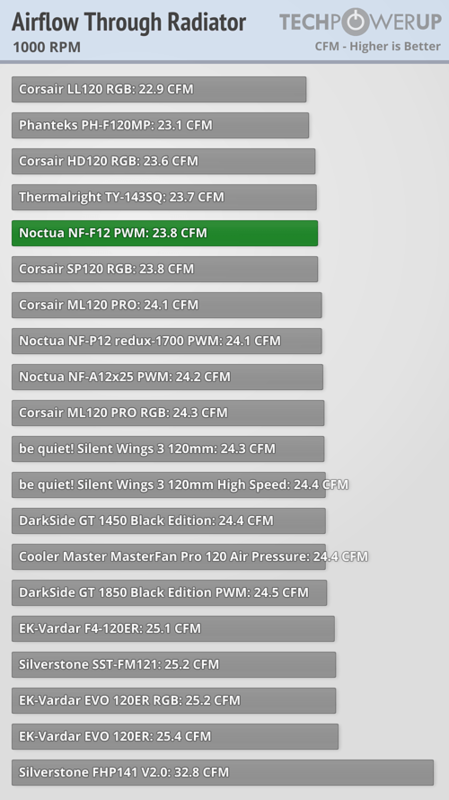 Similarly, the specific RPM values chosen reflect usage scenarios most popular with watercooling even though some fans (the Noctua NF-A12x25, for instance) go higher. The charts are to be considered for comparison within this result set only and are not to be compared with results from another test elsewhere owing to different testing conditions. 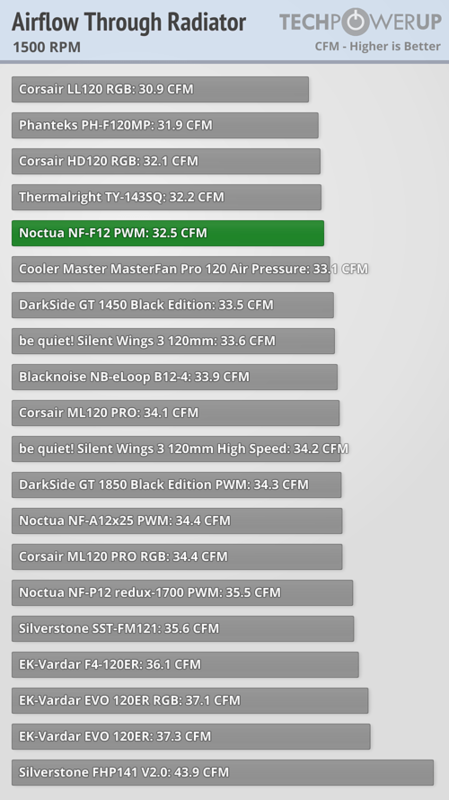 So this is another NF-F12 that tested out just as the others did in that the NF-F12 is not really a great radiator fan. 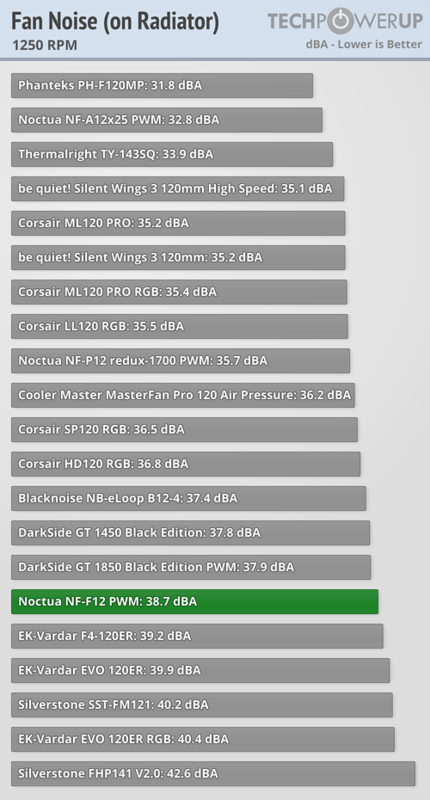 Noctua never advertised it as such, but word of mouth and some questionable testing in the past resulted in people gathering impressions that may not have been well earned. 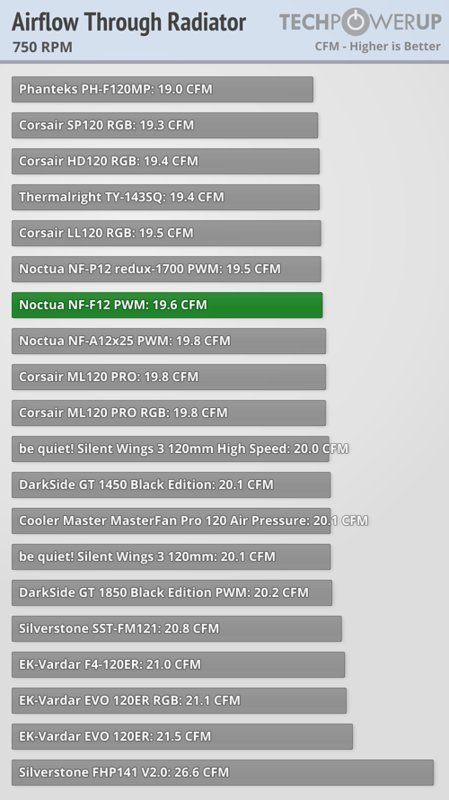 The Noctua NF-F12 PWM chromax, at least in my testing via two separate testing procedures, does not impress in performance, noise, or even performance/noise balance. 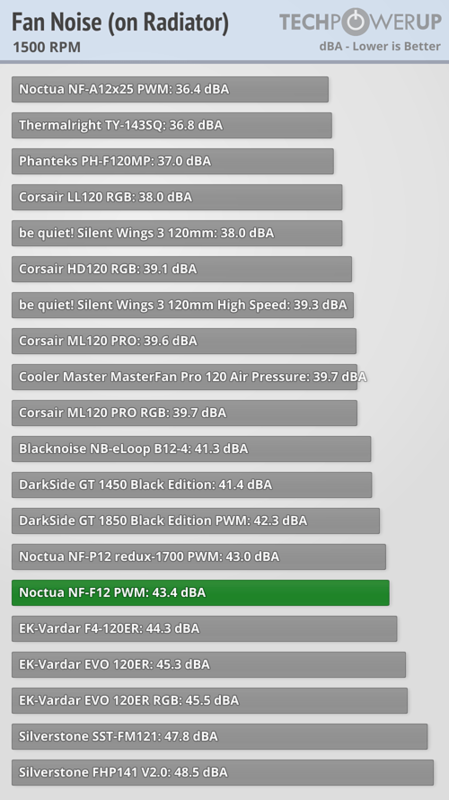 There are better pressure-optimized fans you can find, including some really good ones from Noctua.